Since 1990, the Massachusetts Public Library Construction Program has partnered with local and state officials from 239 communities to build new libraries or expand and renovate existing historic ones. 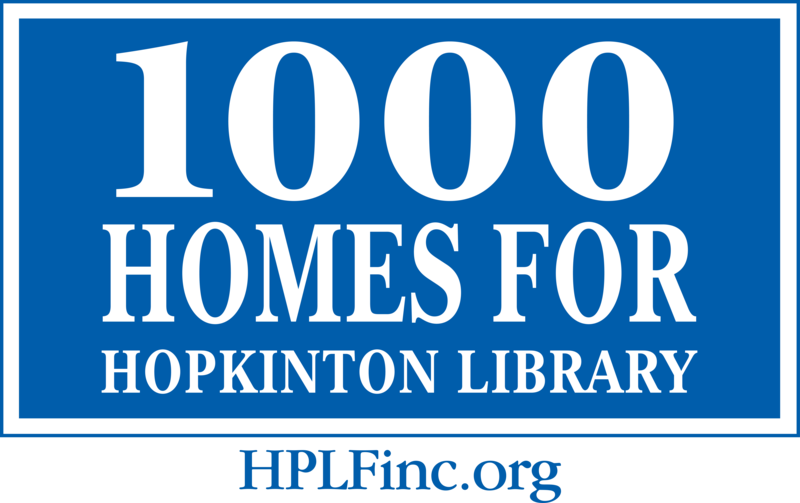 In July 2011, the Massachusetts Board of Library Commissioners (MBLC) awarded Hopkinton a library construction grant of $4,533,580 million. The MBLC expects to fund Hopkinton’s $4.5 million grant as soon as 2014. Below are just a few of the many local library projects made possible with construction grants from the MBLC and the hard work and dedication of community members. On November 6, 2014, several hundred Shrewsbury residents were joined by local and state officials to celebrate the groundbreaking of the Shrewsbury Public Library project. The two-year project will renovate the original 1903 Jubal Howe Building and build a new addition of nearly 32,000 square feet that will allow the library to meet the growing demand for library services. New computers will be added as well as new community meeting space, after-hours meeting rooms, a café, and group study rooms. The $23 million project is made possible through a $7.9 million grant from the Massachusetts Board of Library Commissioners’ (MBLC) Massachusetts Public Library Construction Program, $1.75 million from private donors, and a town bond of $13.6 million. Project completion is scheduled for August 2016. Click here to read more of the MBLC’s Nov. 24, 2014, Press Release on the Shrewsbury Public Library groundbreaking. On September 13, 2014, hundreds of South Hadley residents gathered to celebrate the dedication of their new Public Library. The $10 million project, made possible in part by a $4.8 million grant from the Massachusetts Board of Library Commissioners (MBLC), provides modern, open spaces designed to meet the growing and changing ways in which residents use the library today. Floor-to ceiling windows overlooking the Connecticut River provide natural light throughout the building and spectacular views of the waterfront. The original South Hadley Public Library was built in 1906 and expanded to 8,800 square feet in 1974, but it lacked space to serve the growing needs of the town. There was no community meeting space, a small children’s area, no area for teenagers, and 10 to 12 computers to serve a community of more than 17,000 residents. The new library is more than 22,000 square feet and has a large welcoming children’s room with computers, an activity area for programming, quiet spaces, and a craft area. Teens also have their own room with computers. A large meeting room accommodates 120 people and the library now has 42 computers for the public. 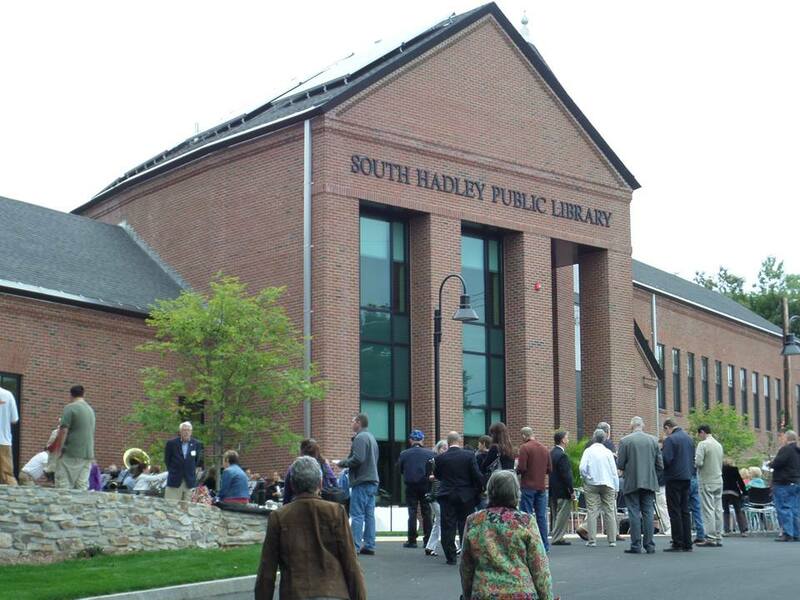 Click here to read more of the MBLC’s Press Release on the New South Hadley Public Library and for more photos and the stunning usage statistics since its grand opening! On March 22, 2014, the recently renovated and expanded West Tisbury Free Public Library on Martha’s Vineyard welcomed townspeople and library officials to celebrate the beautiful new building. 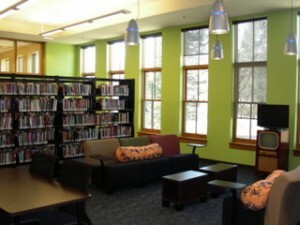 Made possible by strong local support and fundraising, as well as a construction grant from the MBLC, the renovated library was an instant hit with the town and will offer a unique, comfortable community space for many years to come. 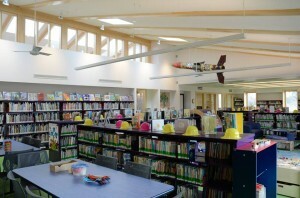 In April 2012, voters in West Tisbury overwhelmingly approved $1.5 million in local funds in order to accept its $2,982,544 provisional Massachusetts Public Library Construction Program (MPLCP) grant to expand and renovate the existing library. A successful capital campaign raised the remainder of the project’s total budget of $6,055,308. From the initial vote to the well-attended dedication — which ended with excited townspeople jampacking the building, as soon as the ribbon was cut — it was clear that a town-wide effort was made to reinvigorate and modernize the library. Click here to read more of the MBLC’s Press Release on the grand opening. On November 22, 2013, the Holyoke Public Library celebrated its grand re-opening after a major renovation and expansion of its original 1902 building, bringing the total area of the library to 41,773 square feet. Both a new children’s area and a new teen space were added, in addition to new computers with wireless internet access, a much larger public meeting room, and dedicated places for quiet study. Click here for the MBLC’s Press Release about the November 22 grand re-opening ceremony. And check out the article and photos from Preservation describing the marriage of old and new in the renovated and expanded Holyoke Public Library. Once, a library measured its success by the number of books checked out. Now what matters is the number of visitors, or gate count. Those visitors expect new computers, big tables with electrical outlets, and comfortable furniture, not the hardback torture devices of yesteryear. Today’s libraries double as community centers where people can learn to use a computer, look for a job, enroll their kids in an art class, and maybe read a book. Holyoke’s library struggled just to be a library…Strolling through the [new] library, you get the feeling that as you go from the old building to the new, you’re walking from inside to outside. 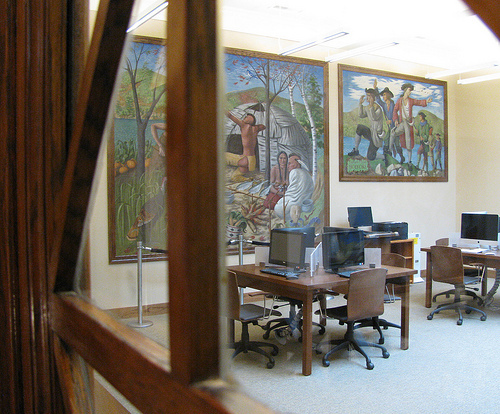 On the first floor, you step through the original building’s windows, which have been transformed into doorways, into the new periodical room. The structures fit together so intricately that there is no precise boundary separating old from new. A broad staircase with glass balusters weaves between the two. The transparent staircase, which greets you as you walk through the front door, also signals how times have changed…On the addition, the architects continued the sandy hues of the original limestone and brick walls and carried through the existing proportions. But it has its own distinct character. It’s airy, intimate, and sunny as a greenhouse. Here, Alexander and his team, like library architects a century ago, thought of the future. Rooms serve multiple purposes, and shelves and furniture can be moved. These nods to flexibility ensure that the building will be able to adapt as its functions evolve in unpredictable ways. On November 16, 2013, Foxborough celebrated the opening of its newly renovated and expanded Boyden Library. 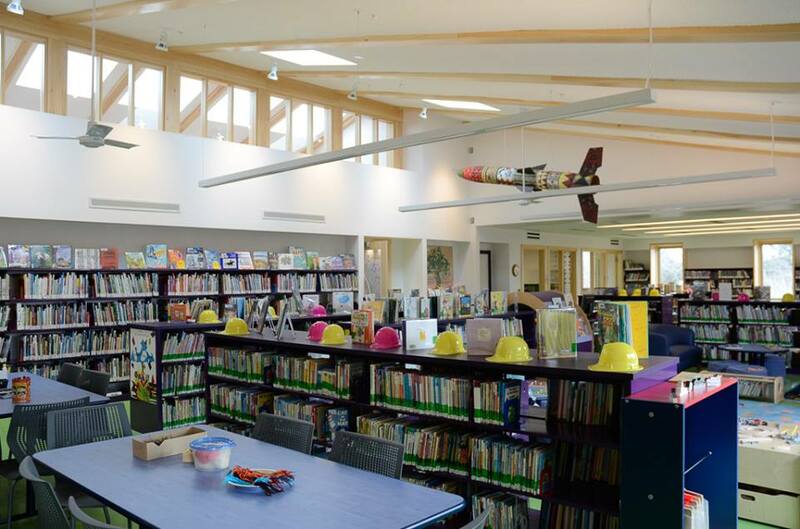 The beautifully designed 34,000 square foot library features a total reconfiguration of all service areas and a 13,800 square foot addition. The expansion doubles the size of the children’s library, creating enough space for more than thirty computers, adds and improves public meeting areas, and makes room to showcase new books and media on the ground floor. 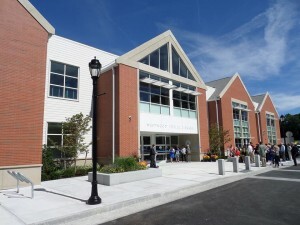 In 2010, the MBLC awarded Boyden a Massachusetts Public Library Construction grant totaling $3,461,606 for this $11.6 million project which broke ground in January 2013. In attendance at the dedication ceremony, State Senator Jim Timilty praised the Boyden Library for its innovation and pointed out the growing importance of libraries in the 21st century. “The internet hasn’t taken libraries out of business. It’s brought more business in,” he said. Click here for the MBLC’s Press Release about the November 16 dedication ceremony. 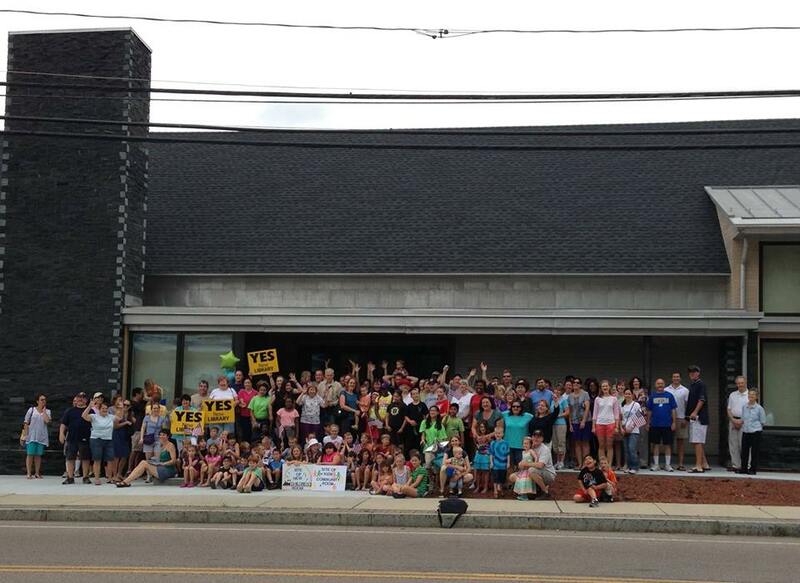 After years of planning, the new Millis Public Library opened its doors to rave reviews and hordes of visitors on July 29, 2013. Features of the new library include an expansive Children’s Room, Young Adult Room, several comfy seating areas, additional computer workstations, five study carrels, two quiet studies, and a large Community Room. 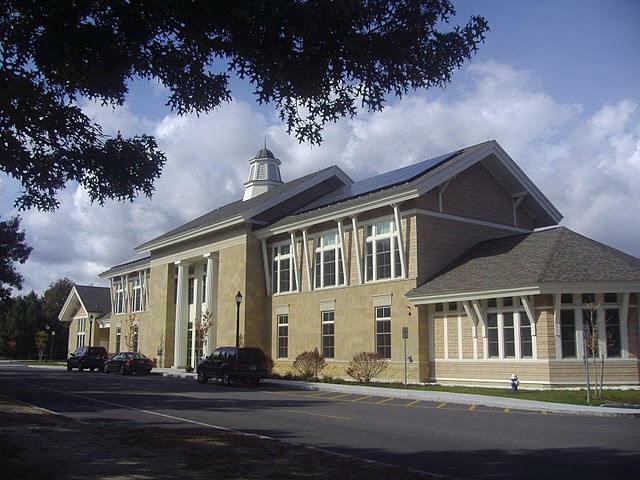 Millis’ new library was made possible in part by a Massachusetts Public Library Construction grant totaling $2,789,569 for this $7.7 million project. 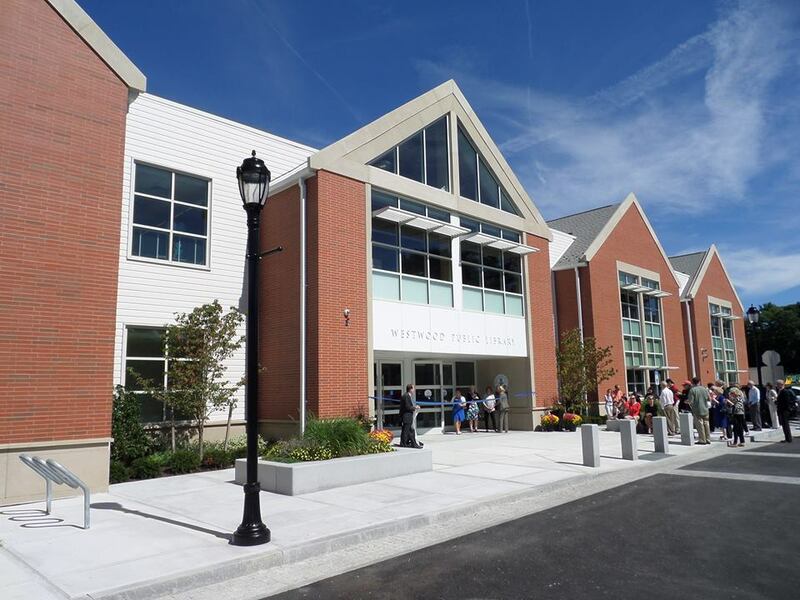 Click here for the Boston Globe’s article on the grand opening and the MBLC’s Press Release about the new Millis Public Library. On September 15, 2013, the Town of Westwood held a dedication ceremony to formally announce the opening of its new library, a 37,000 square-foot, two-story facility with expansive windows and natural lighting containing state-of-the-art technology, art gallery, meeting rooms, children’s library and an open floor plan for the adult collection. Since opening the new doors on July 1, Westwood residents (of which there are 15,000) have visited the library nearly 70,000 times! A $3.7 million state library construction grant helped to fund the $13 million project. To read the September 19, 2013, MBLC press release on the grand opening, click here. The new Northborough Free Public Library, opened in March 2009, maintains the beauty of the original historic 1894 Cyrus Gale building, while adding close to 11,000 square feet of new space. Patrons are greeted at the entrance by a browsing area with newly released books and media. The children’s room, children’s program room and a large meeting room comprise the rest of the first floor. Upstairs, library-goers find fiction, non-fiction, reference materials, magazines and periodicals. The library also has a computer lab, a local history room, an Internet cafe, conference rooms and quiet study rooms. The new teen section provides space for the young adult collections, computer labs, a reading lounge, and space for interactive gaming systems. 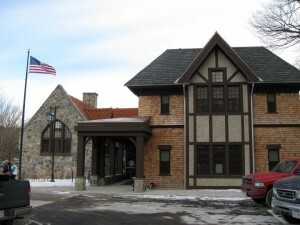 Completed in 2010, the Bolton Public Library was expanded from 2,000 to 16,000 square feet while maintaining the characteristics of the town’s historic library. The original stone building was built in 1904 to serve a population of 750. 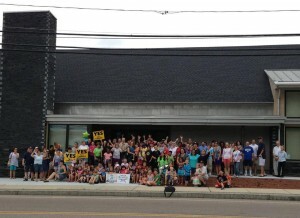 Bolton’s population has grown to about 5,000 and the new addition will allow the library serve its current and future residents. Today, the library houses over 39,000 items including books, magazines, newspapers, music, audiobooks, and movies. The renovated library features a children’s room with storytime and craft space, a young adult area, a local history room, periodicals/reading room, and several quiet study areas. 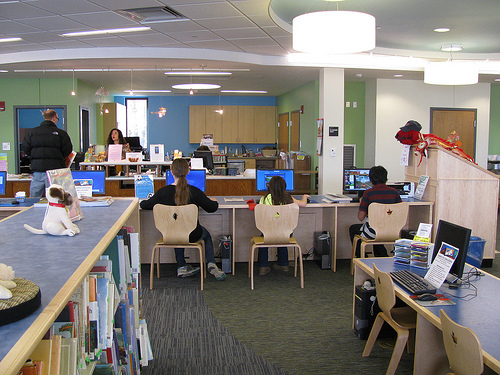 There are public computers for both adults and children as well as wifi access throughout the building. The brand new Mashpee Public Library opened in April 2010. The two-story building occupies the same lot as its predecessor, but at just under 21,000 square feet, it’s about four times bigger. To qualify for its $3 million state grant, the town designed a building for a projected population of 18,000. The children’s section on the first floor features an activities room for programs like arts and crafts and story time. Across the foyer sits a larger events room with seating for 100. A conference room, a kitchen and staff offices make up the rest of the main level. Upstairs, a large, open room houses the majority of the library’s collection. In addition to two study rooms, a space especially for teens features the young adult collection, computers and plush chairs. To read a testimonial from Kathy Mahoney, Director of the Mashpee Public Library, click here.